Authors: Beketova N.A., Vrzhesinskaya O.A., Keshabyants E.E., Kobelkova I.V., Denisova N.N., Kodentsdova V.M. Aim. 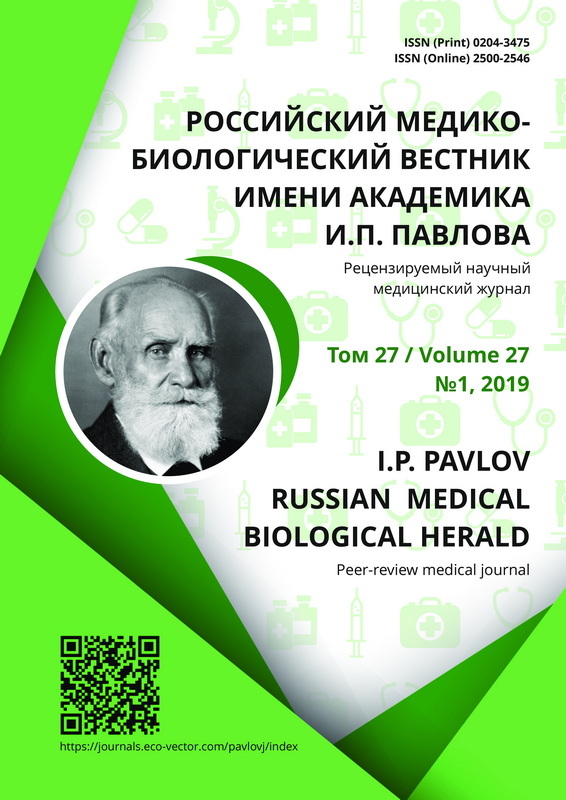 To compare the calculated data of A, B2, D vitamins and beta-carotene consumption with diets and biomarkers of vitamin status of 178 residents of Tazovsky and Gyda settlements of Yamal-Nenets Autonomous Area. Materials and Methods. The actual nutrition was studied by frequency (according to the frequency of food consumption for the previous month) and 24-hour (daily) reproduction methods. Vitamin status was assessed by serum vitamin concentration. Results. A statistically significant relationship between serum beta-carotene level and its consumption with rations was established. There was no significant relationship between the level of fish consumption and vitamin D sufficiency. vitamin sufficiency. Thus, in individuals with a clear lack of vitamin A in the diet on the previous day before taking blood, blood retinol level was in the normal range. actual nutrition, vitamins sufficiency, consumption of vitamins, serum, indigenous and ancestral populations. A potential risk factor for the deve-lopment of vitamin deficiency in the population of the Polar region is the uniformity of the diet, associated both with a limited set of local types of food (mainly fish and fish products, venison) , and with the difficulties of importing certain foods (dairy, vegetables and fruits) in conditions of complex transport accessibility of the territory in combination with extreme climatic conditions. The loss of the egalitarian («horizontal») principle of distribution due to the donation-distribution of reindeer-breeding products within the community serves as one of the factors that violate the maintenance of the nutritional status and health of the indigenous northerners . Low sun rise above the horizon and a short day length in winter do not provide adequate levels of vitamin D in the blood due to its endogenous synthesis in the skin [3,4], which may be one of the reasons for the widespread prevalence deficiency of this vitamin in the North . An additional risk factor for the development of vitamin deficiency in the population of the Polar region can be exposure to pollutants and toxic substances as a result of intensive industrial development of hydrocarbon deposits, which is accompanied by activation of free radical oxidation processes . Several vitamins (B group, E, C, carotenoids) involved in metabolic processes, are antioxidants [7,8], this allows us to consider the biochemical markers of vitamin status as one of the criteria for the integral assessment of adaptation reserves of the body in extreme climatic conditions of the Far North . Aim of the study was to compare the calculated data of vitamins consumption with food rations and the results of the assessment of vitamin status based on the concentration of their metabolites in the blood. The actual nutrition and vitamin status of the indigenous and alien populations were examined in 178 people over 18 years old living in the villages of Tazovsky and Gyda, located in the northeast of the Yamal-Nenets Autonomous Area. 78.9% of the surveyed were women, 21.1% were men. The number of the indigenous population leading a settled, nomadic or semi-emacid lifestyle was 79.2% of all those surveyed, while the alien population was 20.8%. The actual nutrition was studied by frequency (according to the frequency of food consumption for the previous month) and 24-hour (daily) reproduction methods [10,11]. Vitamin status was assessed by the content of vitamins in the serum. The concentration of retinol (vitamin A) and beta-carotene was determined using high performance liquid chromatography , riboflavin (vitamin B2) – by fluorimetric method using riboflavin-binding apoprotein , 25-hydro-xyvitamin D [25(OH)D] (vitamin D) – enzyme immunoassay method using the test system «ELECSYS Vitamin D Total» (F. Hoffmann-La Roche Ltd., Switzerland). Persons with indicators that did not reach the lower limit of the norm  were considered to be insufficiently provided with vitamins. Statistical analysis of the obtained data was performed using the SPSS v.20.0 program (SPSS Inc., USA). Significant differences were considered at p<0.05. Analysis of the actual nutritional data revealed vitamin A intake due to retinol 821.0±169.0 µg RE/day; beta-carotene – 2501.0±205.0 µg/day; vitamin B2 – 1.5±0.1 mg/day . The content of vitamins in the blood serum of the examined was: retinol 41.0±0.9 µg/dL, beta-carotene 14.8±1.1 µg/dL, riboflavin 8.3±0.5 ng/mL, as previously presented . Figures 1-3 show the results of individual assessment of micronutrient status obtained by biochemical methods and actual nutrition indicators for the preceding day for vitamins A, B2 and beta-carotene. The indicators have the form of «clouds», and for vitamin B2 there is a tendency of riboflavin level increasing with vitamin B2 consumption elevation. The lack of correlation between the level of vitamin a intake in the form of retinol and its concentration in the blood is obviously explained by the existing mechanism of maintaining the metabolite concentration at the physiological level both due to the transport of retinol with retinol-binding protein from the liver (vitamin a depot) and due to the conversion of beta-carotene from food to retinol. As can be seen from Table 2, the main sources of vitamin A were fish and fish products, as well as dairy products, beta-carotene – vegetables and fruits, vitamin B2 – meat products, including venison, as well as vegetables. With regard to В vitamins, it is known that their absorption is affected by the food matrix . Thus, for the final conclusion about the interchangeability of the calculated and biochemical methods for assessing the supply of vitamin B2, special studies are required, taking into account its bioavailability from different foods. As can be seen from the data in Table 2, the main sources of vitamin A were fish and fish products, as well as dairy products, beta-carotene – vegetables and fruits, vitamin B2 – meat products, including venison. The statistically significant relationship between the biochemical indices of vitamin status and the consumption of the main food groups (Table 1) was found only for beta-carotene that comes with vegetables and fruits, both in terms of quantity (g/day) and frequency of consumption (portions/day, for the last month). Contrary to expectations and literature data, it was not possible to identify a pronounced relationship between the level of fish consumption and vitamin D status (Table 1). For further analysis, the results were ranked by the amount of consumption of the studied micronutrients (Table 3). Thus, it was established that the concentration of beta-carotene in the serum of the subjects examined in the second and third tretil of intake was statistically significantly higher (1.7 and 2.0 times, respectively) compared to the first tretil. Comparison of two methods for asses-sing vitamin status showed that the data obtained by frequency and 24-hour recall methods do not always make it possible to conduct an objective assessment of individual vitamin status. Thus, in individuals with a clear lack of vitamin A in the diet on the previous day before taking blood, blood retinol level was in the normal range. At the same time, the evaluation of the calculated data of vitamin intake for identifying deviations from optimal nutrition and developing measures for correcting them, as well as identifying groups at risk of developing nutritional deficiency is not in doubt. The data obtained demonstrated the importance of simultaneously using several methods for studying actual nutrition and nutritional status. Martinchik AN, Asaulenko VI, Baturin AK, et al. Evaluation of dietary intake of indigenous and alien populations in Yamal-Nenets Autonomous District. Problems of Nutrition. 2010;79(3):55-60. (In Russ). Kozlov AI, Vershubskaya GG, Kozlova MA, et al. The Influence of the «Traditional» and «Westernized» Distribution of Products in the «Arctic Cuisine» on the Nutrition Status of the Indigenous Northerners. Etnograficheskoe obozrenie. 2017;(6): 146-54. (In Russ). doi: 10.13039/501100002261. Brustad M, Edvardsen K, Wilsgaard T, et al. Seasonality of UV-radiation and vitamin D status at 69 degrees north. Photochemical and Photobiological Sciences. 2007;6(8):903-8. doi: 10.1039/b702947k. Kozlov AI, Vershuchbskaya GG, Ryzhayenkov VG. Syvorotochnyy 25-gidroksivitamin D u naseleniya Permskogo kraya. Meditsinskiy al'manakh. 2015; 4(39):219-22. (In Russ). Andersen S, Jakobsen A, Rex HL, et al. Vitamin D status in Greenland – dermal and dietary donations. International Journal of Circumpolar Health. 2013; 72:e21225. doi: 10.3402/ijch.v72i0.21225. Zholdakova ZI, Kharchevnikova IV. Mekhanizmy protsessov bioaktivatsii chuzherodnykh khimicheskikh veshchestv pod deystviyem fermentnykh sistem organizma. Vestnik Rossiyskoy akademii meditsinskikh nauk. 2002;(8):44-9. (In Russ). Kodentsova VM, Vrzhesinskaya OA, Mazo VK. Vitamins and oxidative stress. Problems of Nutrition. 2013;82(3):11-8. (In Russ). Rakhmanov RS, Blinova TV, Tarasov AV, et al. Antioxidant system as a perspective direction in the assessment of the state and prognosis of population health. Hygiene and Sanitation (Russian journal). 2014;93(6):91-4. (In Russ). Metodicheskiye rekomendatsii po otsenke kolichestva potreblyayemoy pishchi metodom 24-chasovogo (sutochnogo) vosproizvedeniya pitaniya (utv. zam. Glavnogo gosudarstvennogo sanitarnogo vracha RF G.G. Onishchenko) №S1-19/14-17 26 Feb 1996. (In Russ). Martinchik AN, Baturin AK, Bayeva VS, et al. Razrabotka metoda issledovaniya fakticheskogo pitaniya po analizu chastoty potrebleniya pishchevykh produktov: sozdaniye voprosnika i obshchaya otsenka dostovernosti metoda. Problems of Nutrition. 1998;(3):8-13. (In Russ). Yakushina LM, Beketova NA, Bender ED, et al. Ispol’zovaniye metodov v•EZHKH dlya opredeleniya vitaminov v biologicheskikh zhidkostyakh i pishchevykh produktakh. Problems of Nutrition. 1993;(1):43-8. (In Russ). Nikityuk DB, Baturin AK, Pogozheva AV, et al. Problems of nutrition of the population of the Yamalo-Nenets Autonomous District. Scientific Bulletin of the Yamalo-Nenets Autonomous District. 2017; 3(96):96-100. (In Russ). Beketova NA, Kodentsova VM, Vrzhesinskaya OA, et al. Vitamin status of rural residents, living in Russian Arctic. Problems of Nutrition. 2017;86(3): 83-91. (In Russ). doi: 10.24411/0042-8833-2017-00049. Copyright (c) 2019 Beketova N.A., Vrzhesinskaya O.A., Keshabyants E.E., Kobelkova I.V., Denisova N.N., Kodentsdova V.M.